Masterfully constructed by hand in London, England and manufactured in the Algha factory, which dates back to the 1920s. For Men or Women (Unisex). 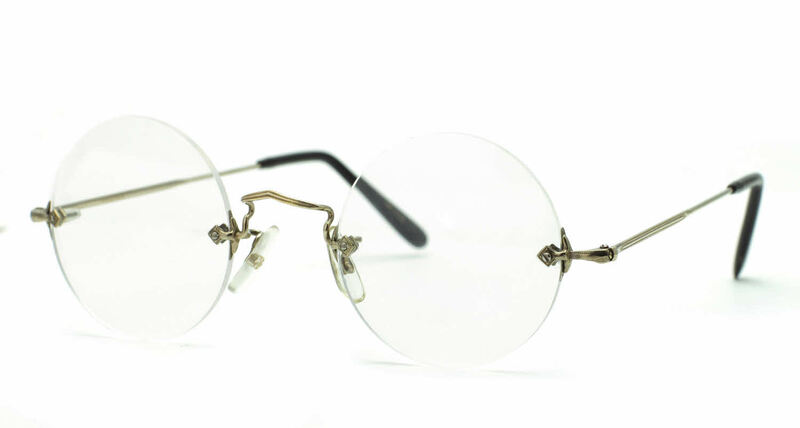 Savile Row 18Kt Diaflex Round is a rimless frame. Features round shaped lenses, a classic bridge with adjustable nose pads, and hockey or cable temple options. Similar to those worn by Steve Jobs. Savile Row's Diaflex (rimless) Collection features sleek, professional frames that are light weight and sophisticated. All Savile Row frames come with a cleaning cloth and protective carrying case. Excellent frames, well-constructed (as one expects given the price). My only frustration was the long wait for the eyeglasses to be shipped, but that also was to be expected given the UK build and the obviously hand-crafted frame. Frames Direct online tools and support were excellent. I doubt I'll choose to buy eyeglasses locally again. I cannot begin to express how much I love this specific frame. They are light weight, comfortable, and add a very unique touch of sophistication to my persona. I felt that an eye size of 44 would have been too big for my face so I called the company and being that the frames were rimless, I was able to have the size of the lenses reduced to 42. I loved that I had that option. Upon putting them on my face, they hugged my face a bit too tight so I had to bring them to my optician to be adjusted. Once I did that, I was completely satisfied with them. I am rating my satisfaction with the frames at three stars due to the service because although the Frames Direct staff were friendly and helpful, I ordered these frames on October 20th 2017 and I did not receive them until December 28th, 2017. I understood that the delays were due to my glasses not being 100% to their standards but regardless, I was very angry at how long I had been waiting for them to arrive to me. The wait was much longer than what was advertised, and I experienced many periods of frustration upon being told multiple times that the frames would be delayed but besides that, the wait was well worth it because I am very satisfied with my purchase. Bought these glasses just over one year ago. Love them !! They are so light and comfortable that I often forget I'm wearing glasses. Also I like that I don't see frames in my vision. I wear them everyday ! Only one problem - They are so comfortable that I can forget to remove them before falling asleep . Would buy again in a heart beat ! They are very nice. The company does a good, clean job. I would like to see them create a pair that makes the round glass a little larger in size. It would just be different. Over all the ones I got are still pretty sharp and professional looking which is what I was aiming for. Thank you. Absolutely the lightest, most comfortable pair of glasses I have ever worn. I started wearing glasses in 1960.